​Hong Kong, November 5, 2013 – Vacancy rates in the Asia Pacific region dipped in Q3 2013, as few office building completions offset low leasing volume driven by a subdued level of occupier demand, according to the latest report by leading commercial real estate firm, CBRE. The third quarter saw occupiers, with a few exceptions, remain cautious, and this conservative attitude was reflected in the limited volume of leasing transactions. Of the deals that were signed, most involved renewals; expansions were limited. 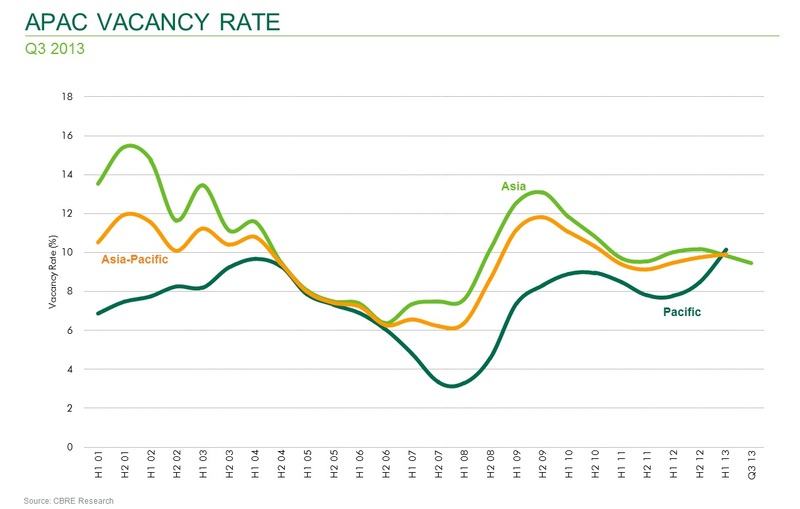 The overall vacancy rate for the Asia Pacific region slightly declined from 9.82% to 9.43% in Q3 2013. Vacancy fell in 11 markets, was flat in eight and rose in another seven. At the same time, only 4.7 million sq. ft. of new office space was completed in Asia Pacific in Q3, well down on the 9.7 million sq. ft. of new supply added in Q2 2013. This was the lowest quarterly volume of stock completed in Asia Pacific since Q4 2006, when the rate was 5.8 million sq. ft.
Against this background, demand for office space in Asia Pacific weakened—on the heels of cautious occupier sentiment—with net absorption for Q3 totaling 6.7 million sq. ft., the lowest figure recorded since the market began to recover from the global financial crisis in Q1 2010. “Whilst we expect a number of substantial and high profile transactions to be completed during the year, occupier sentiment will generally remain cautious into 2014. MNCs will continue to develop cost-effective occupational solutions—with a particular focus on decentralized areas—and rationalization and consolidation will remain key demand drivers. Leasing activity by domestic corporations will continue to be strong in many markets and smaller- to medium-sized requirements will account for the bulk of leasing deals,” says John Falkiner, Managing Director, Transactions, CBRE Asia. Opportunity for Better Leasing Deals? Office rents have been flat for the past two years and are likely to remain so in the short term; however, downward pressure is likely to increase as a large volume of new supply becomes available—with annual new supply expected to reach all-time highs in the next two years. “The pressure on rental levels will increase in 2014 as a large volume of new supply comes on stream giving occupiers the opportunity to secure attractive leases. We should start to see occupiers considering postponing expansion plans or pre-committing to this new supply to secure better terms,” said Jonathan Hsu, Director, CBRE Research, Asia Pacific. 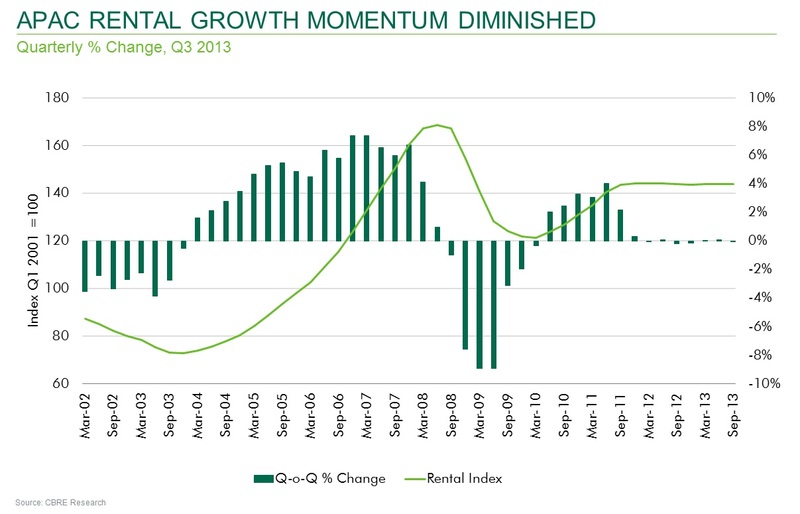 The CBRE Asia Pacific Office Rental Index stayed flat for an eighth consecutive quarter. Rents were unchanged on a year-on-year basis, and Grade A rents in most markets continued to display little movement during the period, although there were a few exceptions, with Jakarta posting the strongest rental growth. Annual new supply coming online will reach an all-time high in 2014 and 2015, with the majority of new supply set to be completed in emerging markets. India and China account for 74% of new supply scheduled for completion during that period, much of which will be in secondary locations. However several new schemes in India are likely to be delayed further which may help ease oversupply pressure. A number of first-tier cities in China—excluding Beijing—will also see the addition of a large volume of new stock over the next couple of years, as will Jakarta.